Did you know that great Indian civilizations like Maya and Anasazi went down primarily due to environmental disasters like erosion and aridity? Did you know that the Sumerians in Mesopotamia, such a creative and influential society, collapsed due to the salinization of the soil? Did you know that improper irrigation practices brought at least one third of all agricultural land in Australia into an unusable state for at least 100 years, again due to salinization? Do you know why the biggest island of the world Greenland is named “green land” at all? Is there anything green about this island of ice and snow? But it was quite green with lush forests and pastures; a paradise-like place until the 13. century before the Norse people with Scandinavian origins decimated its forests and transformed the island into a desert of ice. The Norse people were initially not aware of the fragility of Greenland’s ecology with extremely slow growing trees. They expected the same robustness and recovery power of Norway from their new environment. Did you know that Japan was on the verge of a collapse in the 17. century caused by erosion and wood scarcity, and escaped a disaster by radical regulations to for protecting and rehabilitating its decimated forests? Why is the economic situation of Dominican Republic is much better than Haiti? What made the difference in the destiny of two countries sharing the same island? Why could Dominican Republic manage its natural resources much better than Haiti? 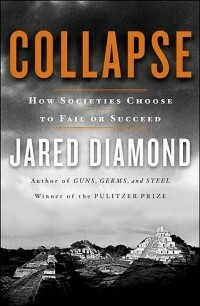 Jared Diamond’s Collapse is without any doubt one of the most important and interesting books I have ever read. In that high category I can compare it only to few examples like Richard Dawkins’ Selfish Gene and Naomi Klein’s Shock Doctrine. Jared Diamond makes us aware of the significance of environmental factors for societies’ well-being. He also makes us question the one-dimensional development doctrine in the classical school of economy. A doctrine which measures development with man-made tools and services largely ignoring the nature-made services that can be so crucial for the sustainability of societies. Nature is our prime producer which produces clean water and air, solar energy, mild climate, fish in oceans, soil for agriculture, inspiration for beauty and fine arts. What’s the use of luxury motorcars and notebooks if you lack clean water and pure air? As the Turkish proverb says “ivory comb for a bald head”! (kel basa simsir tarak). Astronomy taught us that our Earth isn’t the center of the universe but merely one of billions of heavenly bodies. From biology we learned that we weren’t specially created by God but evolved along with millions of other species. Now archaeology is demolishing another sacred belief: that human history over the past million years has been a long tale of progress. In particular, recent discoveries suggest that the adoption of agriculture, supposedly our most decisive step toward a better life, was in many ways a catastrophe from which we have never recovered. With agriculture came the gross social and sexual inequality, the disease and despotism, that curse our existence. I attach the following video for your convenience: Jared Diamond speaks about Jared Diamond’s Collapse. NGC time travels 200 years into the future to see what the world would look like after civilization as we know it collapsed. Guided by author Jared Diamond, we’ll piece together the remarkable story of what on earth triggered our decline. This entry was posted on Friday, December 30th, 2011 and is filed under Sustainable life. You can follow any responses to this entry through RSS 2.0. You can skip to the end and leave a response. Pinging is currently not allowed.